Her Birthday: September 17th, 2018. Karima is on a MISSION! She is excited to share her passion for sustainable cities with children in classrooms all around the World! Can you think of ways to make your city greener? Can you take action with your classmates to make your school or neighbourhood more environmentally friendly? 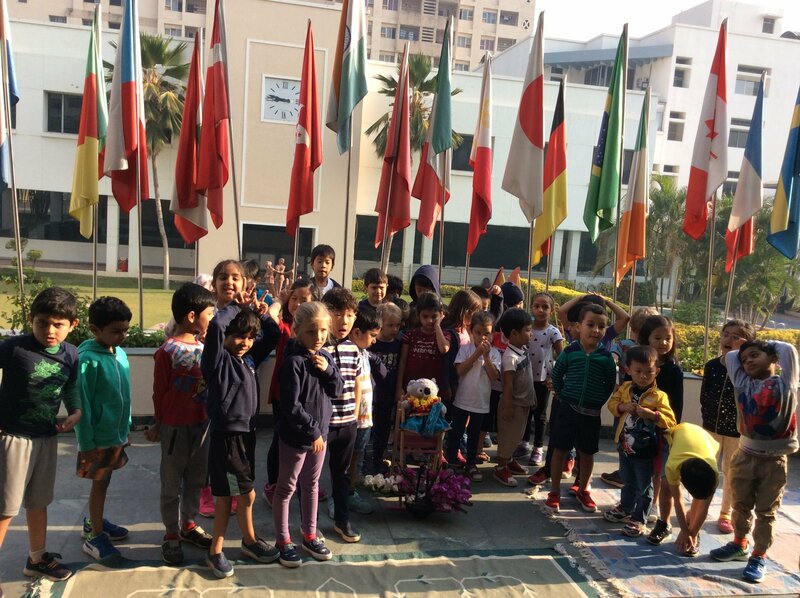 At her first stop in Riyadh, Saudi Arabia Karima learns about the ways that AIS-R is environmentally friendly with KG2 students. Karima reads about an exciting new project, NEOM. This city of the future will be built with sustainability, environmental principles and renewable energy in mind. 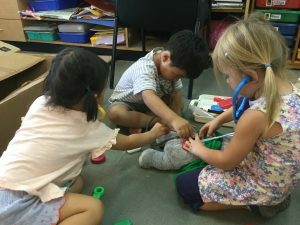 Karima’s stay in Preschool at MBIS. 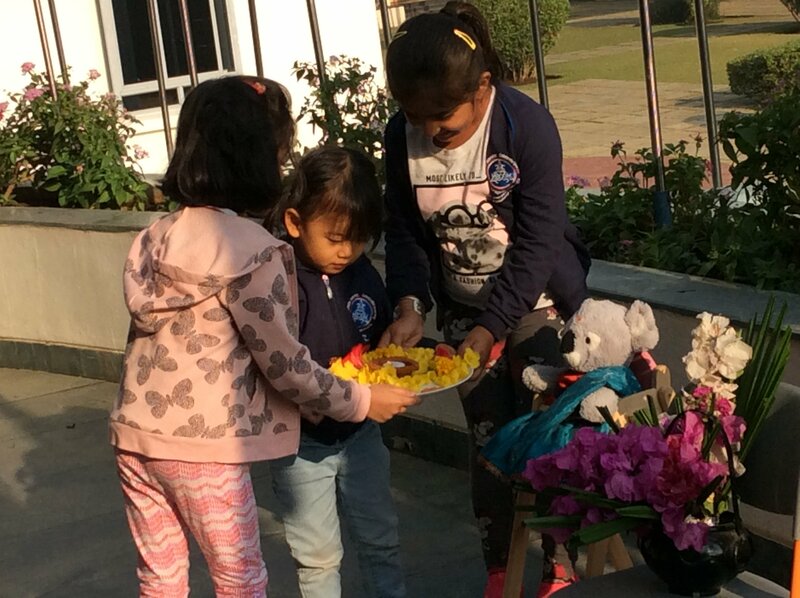 In India, we celebrate Children’s Day on the 14th of November so we were very lucky to have Karima arrive on that special day. The teachers had planned some special treats which were a surprise for the children. Karima was also a part of the ‘big’ surprise. 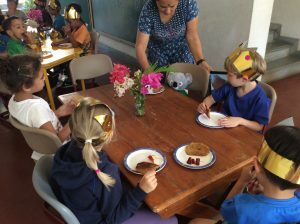 The children decorated golden paper crowns for themselves, helped the teachers in washing and cutting the fruit for the fruit kebabs and helped mix the ingredients for the pancakes. 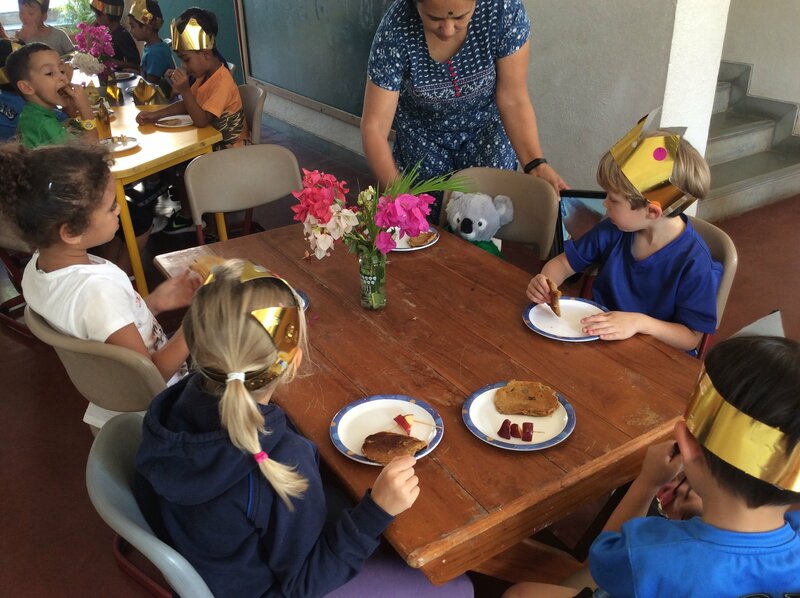 After the table was set for their little party, we introduced Karima to the children, who were thrilled to meet her and wanted to share their crowns and treats with her. 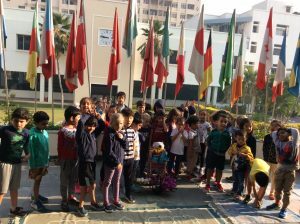 We hope Karima enjoyed the Children’s Day party and had an exciting first day with our Preschoolers. The children spent a lot of time with Karima showing her all that they do in PS1 and making her feel part of the class by engaging her in their play at the restaurant, building models out of wooden blocks with her, flying with her to the jungle gym on their pretend plane, looking after her daily needs such as food and sleep and letting her watch them as they cooked for their picnic or read their books. Karima read books with some children and watched them plant strawberry seedlings. The children also baked cookies shaping them as the first letter of their name. They added warm water instead of egg and used brown rice flour and once baked decorated their cookies. The children enjoyed baking cookies with Karima and sharing them with their PS3 friends for an afternoon snack. The children invited Karima to learn about their UN Goal no.7- Affordable and Clean Energy. They first discussed what clean energy was and they told Karima that we can get clean energy from water, the sun and wind. The children made pinwheels with her and had fun testing them. They then watched some videos on how a real wind turbine is made. The children and Karima also did yoga with MS. Shambhavi. Karima had a spectacular day! 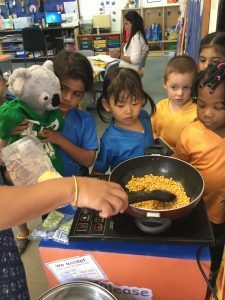 The Goodbye to Karima the Koala assembly was led by our maids and a few of our risk takers from PS1,2 and 3. A special puja ceremony was done and we sang a goodbye song. The children were curious to know what Karima’s next destination was and how she would get there. Someone asked if we would be going to the Post Office to send her away, a connection made with our previous learning from the Preschool Postcard Exchange. We hope she reaches her next school safely and we look forward to her next visit.